Exactly 100 years ago today, the British Army sent tanks into action for the first time at the Battle of Flers-Courcelette, part of the Somme offensive, changing the nature of warfare forever. 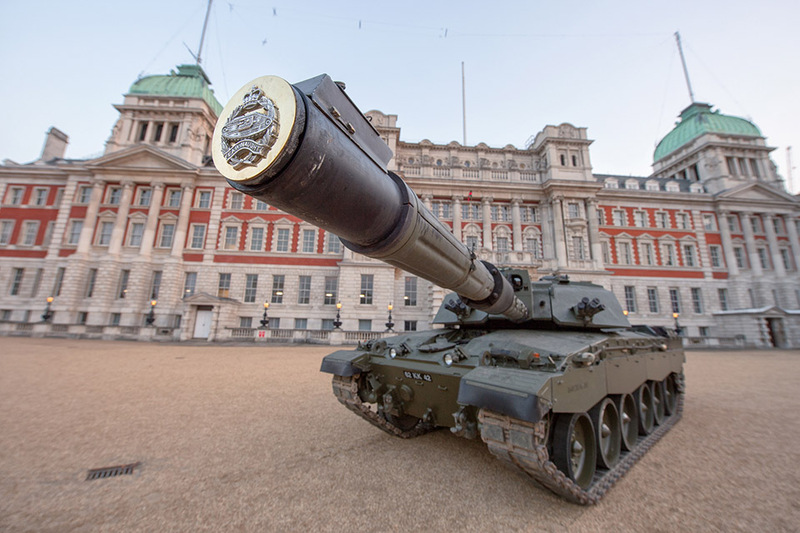 A Challenger 2 at Horse Guards in London. To mark the centenary of the tank and to honour those who made history, the Royal Tank Regiment and the Tank Museum are in Central London to display both the oldest and latest examples of tank warfare. The tank changed the face of modern warfare. We remember the bravery of those very first tank crews and celebrate the world-leading innovation of our Armed Forces. Those values remain hallmarks of UK defence today. Our Armed Forces are in action in 25 countries across the globe and we are investing in the equipment of tomorrow, including more than £3.5billion on the next generation of armoured vehicles. 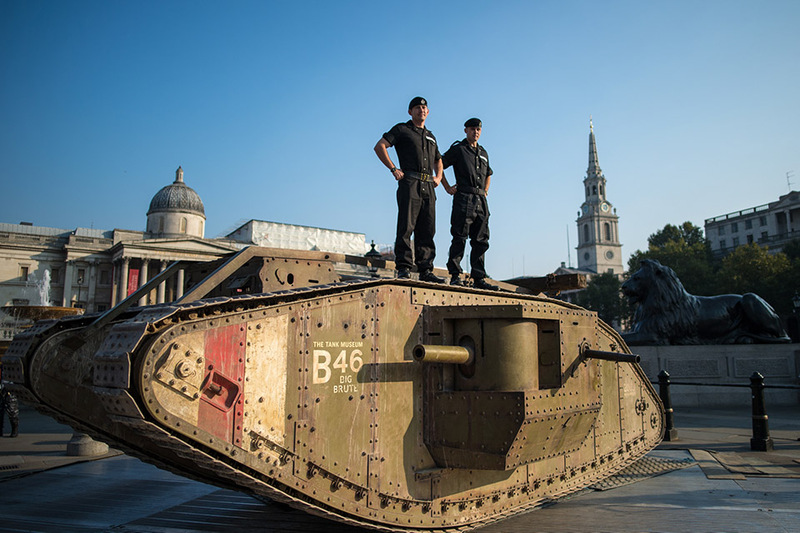 As part of today’s events, a replica of a British First World War tank was displayed in Trafalgar Square before moving to Horse Guards Parade where it was joined by the British Army’s latest Challenger 2 tank, crewed by members of The Royal Tank Regiment. During the First World War, to raise funds for the new tanks, the government sent tanks ‘on tour’ around the country. These new ‘wonder weapons’ attracted huge crowds. Trafalgar Square hosted several ‘Tank Banks’ so it is fitting that today it once again played host to a tank crew. A British First World War tank displayed in Trafalgar Square with members of the Royal Tank Regiment. The Royal Tank Regiment, which is the oldest tank unit in the world, can trace its roots back to the assault on the 15th September 1916. After that battle the importance of the tank was soon recognised and production increased. During the Second World War the Regiment had as many as 25 battalions fighting all over the world. Since then, the Regiment has been deployed on all major conflicts most recently being involved in operations in Iraq and Afghanistan. The original First World War tank went from concept to combat in under two years. That spirit and dedication to innovation remains strong in the military today. The MOD continues to invest in keeping our tank fleet world class; the Challenger 2 will undergo a significant life extension programme keeping it at the forefront of the British Army’s warfighting capability. Furthermore £3.5 billion will be spent on the manufacturing phase of a programme to build 589 AJAX armoured vehicles which will be at the heart of the Army’s new strike brigades. Read more here. Later this year, women will train as tank crew for the first time. Much has changed but like the tank crews of 1916, today’s crews share unique comradeship forged from working as a tight knit team operating the most formidable weapon on the battlefield. The Battle of the Somme, fought between July and November 1916, was one of the defining events of the First World War with more than one million casualties on all sides during the 141 days of the battle. In the first six weeks of the Somme offensive repeated Allied attacks had failed to achieve the progress that the senior leadership had planned. To break the deadlock, Sir Douglas Haig planned a major attack on the 15th September 1916 to destroy German strong points between the villages of Combles and Courcelette. He also took the controversial and historic decision to reveal the British secret weapon, and commit tanks to this attack. The effectiveness of tanks was unknown. They promised much: the ability to cross trenches and wire, advance alongside the infantry protecting them and the crew, and to destroy German positions with a combination of cannon and machine guns. But they were slow, mechanically unreliable, the crews lacked experience and there had been no training alongside the infantry. Most significantly there were only 49 tanks available.